Since the summer of 2013, foot and ankle surgeon, Dr. James Cottom, began offering a new and innovative surgical technique to patients with ankle arthritis. For patients suffering from advanced arthritis in the ankle, Dr. Cottom utilizes the INFINITY™System, a total ankle replacement system that is effective and has some advantages over current FDA approved total ankle implants. This implant is unique in that it is compatible with PROPHECY™ Pre-Operative Navigation Alignment technology. 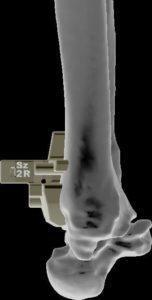 PROPHECY™ technology uses CT scans to create ankle alignment guides unique to each patient. These guides play an important role in the overall success of the ankle replacement procedure because they allow surgeons like Dr. Cottom to properly size, place and align ankle components during the surgery. Together, this combination has provided Dr. Cottom with a surgical solution that both reduces or eliminates ankle pain and improves mobility for his patients. In 2013, Dr. Cottom was among some of the first surgeons in the country to adopt usage of the new INFINITY Total Ankle Replacement (TAR) System. Released in June 2013 by the same manufacturer as the INBONE II System, the INFINITY™ System uses a smaller implant that results in less overall bone loss. Supported by the same PROPHECY™ technology, the INFINITY™ System also shortens procedure times, is less invasive for surrounding joints (i.e., no need for drilling across the subtalar joint), does not violate the anterior tibial cortex (i.e., there is less chance of osteolysis, or loosening, around the tibial implant piece), and allows for a talar resurfacing option. Furthermore, the new system is compatible with the old system, allowing for a certain mixing and matching of components for those patients who need it. A recent study by Greg Berlet, MD et al. published in Foot & Ankle International detailed both the repeatability of the PROPHECY™ patient-specific surface-match alignment guides and the accuracy of the resulting final implant positioning. The paper concluded that preoperative navigation and CT-scan derived alignment guides result in reliable and reproducible placement of TAA implants. Dr. Cottom completed his 12-month surgical Orthopedic Foot and Ankle Fellowship with Dr. Berlet in Columbus, Ohio in 2007. “The average variation between preoperative and postoperative implant placement was less than 2 degrees and 1.4mm in all specimens tested,” Berlet GC, Penner MJ, Stemniski PM, et. al. 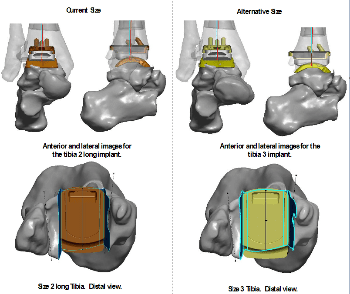 FAI 2014 Total Ankle Arthroplasty Accuracy and Reproducibility Using Preoperative CT Scan-Derived, Patient-Specific Guides. If you suffer from ankle pain, contact Dr. Cottom at Florida Orthopedic Foot & Ankle Center for a proper evaluation at 941.924.8777.